Now this might not exactly fall into the category of “sightseeing in Bangkok” – but it is still a great experience you can have in the city. It’s not “Thai” in any way, but completely Western. But sometimes it is nice to make a little jump into “familiar terrain”, and get a break from all the exotic things that can be overwhelming for some people. If you like cakes, pastries and breads – then the Bangkok Baking Company is a place worth checking out. And considering that it is located on the ground floor of the prestigous JW Marriot hotel, the prices are very fair. The selection is… well, let me put it this way: if you’re on a diet, and you want to lose weight, then DO NOT come here! You can also enjoy a nice latte, imported beer,high quality chocolates, they have quiches, croissants (including “banana” or “whole-wheat”), doughnuts, raspberry tart, and all kinds of other evil things. It is also a great place for breakfast – for example, come here for some good eggs benedict. 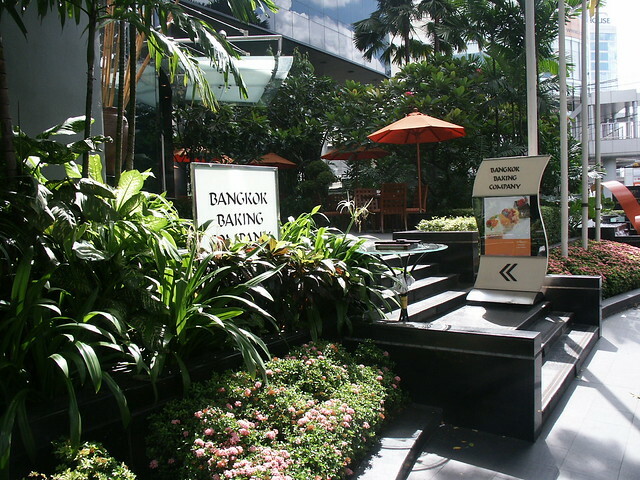 The Bangkok Baking Company is located on the ground floor of the JW Marriott Hotel in Sukhumvit Street, between Soi 2 and 4. Its a must , i cant get enough of the cakes there. Watch out for a full write up with lots of pics coming shortly on my blog. looking forward to your write up! My husband and I go here to eat breakfast once a week. Afterwards we purchase some goodies to keep in our apartment. Everything’s scrumptious!